L 14 1/2″ (37 cm) W 31″ (79 cm). Description: Sexes similar. 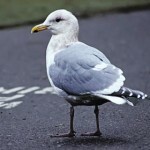 Breeding adults are silvery-gray above and white below; underside of primaries are silvery, rather than black as in Common Tern; deeply forked gray tail; black cap and nape; orange-red bill with black tip; and orange legs. 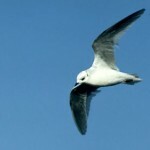 Non-breeding birds lack black cap, instead have black patch around eye; and a black bill. 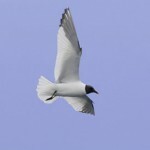 Habitat: Migrants can be found on lakes, rivers, and marshes. Breeding occurs on large marshes with extensive areas of emergent vegetation for nesting sites. Where in Nebraska: Common spring and fall migrant across the state. Local summer resident in the Sandhills area. Field Notes: Breeding birds in Nebraska seem to avoid small marshes as nesting habitat. 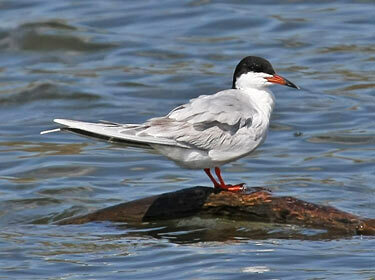 Fun Facts: Forster’s Terns are the only terns restricted almost entirely to North America throughout the year.